Vascular endothelium tightly controls leukocyte recruitment. Inadequate leukocyte extravasation contributes to human inflammatory diseases. Therefore, searching for novel regulatory elements of endothelial activation is necessary to design improved therapies for inflammatory disorders. Here, we describe a comprehensive methodology to characterize novel endothelial regulators that can modify leukocyte trafficking during inflammation. Higueras, M. Á., Jiménez-García, L., Herranz, S., Hortelano, S., Luque, A. Screening Assays to Characterize Novel Endothelial Regulators Involved in the Inflammatory Response. J. Vis. Exp. (127), e55824, doi:10.3791/55824 (2017). The endothelial layer is essential for maintaining homeostasis in the body by controlling many different functions. Regulation of the inflammatory response by the endothelial layer is crucial to efficiently fight against harmful inputs and aid in the recovery of damaged areas. When the endothelial cells are exposed to an inflammatory environment, such as the outer component of gram-negative bacteria membrane, lipopolysaccharide (LPS), they express soluble pro-inflammatory cytokines, such as Ccl5, Cxcl1 and Cxcl10, and trigger the activation of circulating leukocytes. In addition, the expression of adhesion molecules E-selectin, VCAM-1 and ICAM-1 on the endothelial surface enables the interaction and adhesion of the activated leukocytes to the endothelial layer, and eventually the extravasation towards the inflamed tissue. In this scenario, the endothelial function must be tightly regulated because excessive or defective activation in the leukocyte recruitment could lead to inflammatory-related disorders. Since many of these disorders do not have an effective treatment, novel strategies with a focus on the vascular layer must be investigated. We propose comprehensive assays that are useful to the search of novel endothelial regulators that modify leukocyte function. We analyze endothelial activation by using specific expression targets involved in leukocyte recruitment (such as, cytokines, chemokines, and adhesion molecules) with several techniques, including: real-time quantitative polymerase chain reaction (RT-qPCR), western-blot, flow cytometry and adhesion assays. These approaches determine endothelial function in the inflammatory context and are very useful to perform screening assays to characterize novel endothelial inflammatory regulators that are potentially valuable for designing new therapeutic strategies. Inflammation is a beneficial biological response against infectious agents, with the major aim to eliminate the pathogen and repair damaged tissue. Under certain conditions, such as chronic infections or autoimmune diseases, inflammation does not resolve. Instead, there is an aberrant reaction with continuous infiltration of leukocytes, resulting in a prolonged immune response that leads to tissue damage, fibrosis, loss of function, and overall, disability and in some cases death of the patient. These human disorders, cataloged as inflammatory diseases, all involve the blood vessels for the control of leukocyte extravasation1,2. The endothelial cells play a fundamental role in the regulation of the inflammatory response by controlling leukocyte trafficking. When the endothelial layer is exposed to inflammatory mediators such as LPS, the resting endothelium activates and expresses pro-inflammatory cytokines (Cxcl10, Cxcl5, Cxcl1, etc.) and adhesion molecules (E-selectin, VCAM-1 and ICAM-1) that favor recruitment of circulating leukocytes to the infection site. The leukocytes primed by the released cytokines then mediate rolling and interaction with the endothelial layer through the correspondent adhesive counterparts: PSGL-1 to selectin, α4β1 integrin to VCAM-1, and αLβ2 integrin to ICAM-1. Finally, the leukocytes migrate across the vasculature towards the focus of inflammation3. The essential role of the endothelium in regulating the inflammatory response has been demonstrated on mice that were genetically modified to express the LPS receptor, toll-like receptor 4 (TLR4), only on the endothelial cells. These endothelial-TLR4 animals were able to respond to an LPS-mediated inflammation and to detect the infection generated after bacteria inoculation, and consequently achieve infection resolution and survival at similar levels as the wild type mice4,5. For the endothelium-regulated inflammatory response pathway, it has been postulated that the inhibition at some stages of the leukocyte-endothelium interaction would result in the reduction of trans-endothelial migration and a better prognosis for inflammatory-related diseases. In fact, several strategies targeting the endothelial activation and leukocyte-endothelium interaction have been designed to hinder extravasation of immune cells as a treatment for inflammatory disorders6,7. In this report, we describe a thorough group of in vitro techniques to fully characterize the endothelial activity in response to the inflammatory stimulus LPS and its role in leukocyte activation and adhesion to the vascular layer. The endothelial cell model used in this manuscript was the mouse lung endothelial cell line (MLEC-04), as described by Hortelano et al.8. The MLEC-04 cell line has been validated in the literature to be an appropriate system to study endothelial activation9,10. Based on research interests, these approaches can be easily extrapolated to any endothelial or leukocyte systems and inflammatory profile. Once the endothelial parameters in the selected conditions are defined, the system can test novel drugs on the proposed experimentation to evaluate the vascular activation. In this inflammatory context, the endothelium cells tested with the compound of interest can be compared to the control conditions of the cells, and any resulting differences may inform the drug's prognostic outcome on development and progression of inflammation. To conclude, we propose a relevant system to characterize new drug targets to the endothelial cells, which can influence the design of novel vascular-specific therapies against inflammatory-related diseases. Coat 100 mm tissue culture plates with 2.5 mL gelatin solution (autoclaved, 0.1% gelatin in distilled water) for 30 min at 37 °C; this can be extrapolated to the required well format. Aspirate the gelatin solution and leave plates to air-dry in the tissue culture hood. Cultivate the MLEC-04 cells inside a biological incubator (37 °C, 95% humidity, 5% CO2). Grow the cells in complete media of Dulbecco's Modified Eagle Medium: Nutrient Mixture F-12 (DMEM/F-12) supplemented with 10% Fetal Bovine Serum (FBS) and 100 units/mL penicillin and 100 µg/mL streptomycin (P/S). Count the cells by the standard Neubauer chamber method, and add the MLEC-04 cells to the 100 mm gelatin-treated plates in 10 mL complete media, at a low density of 2 - 11 x 104 cells/cm2. Split the cells 1:3 when they reach confluence. NOTE: Usually this occurs after two to three days in culture. Subculture the cells by washing the plates with 10 mL sterile Phosphate Buffered Saline (PBS) followed by adding 2 mL trypsin-EDTA solution (0.25% trypsin, 5 mM EDTA) and incubate for 3 min at 37 °C. Stop the trypsin-EDTA reaction and recover the suspended cells by adding 10 mL complete media. Spin down the cells (300 x g, 5 min), discard the supernatant, resuspend the cellular pellet in complete media and subculture appropriately. Plate the MLEC-04 cells in complete media at sub-confluence into the following well format: 7 x 105 cells/well on 6-well plates and 2.5 x 105 cells/well on 96-well plates. Incubate the culture for 6 h in a cell incubator (37 °C, 95% humidity, 5% CO2). Switch the cells to incomplete media (DMEM-F12, P/S) and leave overnight (ON) to synchronize and to reduce the cell activity. Remove the media and test novel pharmacological compounds by incubating the endothelial cells with (or without) the drug in question (e.g. DT10) diluted in the incomplete media (30 min, 37 °C); add 1.4 mL/well for 6-well plate or 0.14 mL/well for 96-well plates). Challenge the cells by adding LPS to the incubation media (100 ng/mL, final concentration) for the period of time specified in each assay. Use PBS as a control. Seed the MLEC-04 cells at sub-confluence in 6-well culture plates (7 x 105 cells/well). Incubate for 6 h (37 °C, 95% humidity, 5% CO2) and afterwards proceed to serum starvation (incubate ON). Remove the media and treat (or do not treat) the endothelial cell cultures with the drug of interest diluted in the incomplete media (incubate 30 min, 37 °C); add 1.4 mL/well for 6-well plate (30 min, 37 °C). Challenge the cells by adding 100 ng/mL LPS to the incubated media (as described in step 2.3) and incubate for 6 h. Stop the reaction by washing twice with cold PBS and keep plates at -80 °C until sample processing. Thaw the plates and add 1 mL/well RNA extraction buffer (38% phenol and 0.8 M guanidinium isothiocyanate; see table of materials). Leave for 30 min at room temperature (RT) under agitation and collect homogenate in 1.5 mL tubes. Add 200 µL chloroform and agitate gently for 15 s. Incubate for 3 min at RT and centrifuge (11,600 x g, 15 min, 4 °C). Transfer aqueous phase to another 1.5 mL tube. Precipitate RNA by adding 500 µL isopropanol followed by a 10 min incubation at RT and then centrifugation (11,600 x g, 4 °C). Discard the supernatant and wash the pellet with 75% ethanol by vortex agitation and then centrifugation (7,500 x g, 4 °C). Air-dry the pellet and solubilize RNA in 25 µL pure H2O by incubating for 10 min at 55 °C. Keep RNA at -80 °C until sample processing. Quantify the RNA concentration by measuring the absorbance of the sample at 260 nm in a spectrophotometer (see Table of Materials). Measure at 230 nm and 280 nm to determine the RNA purity. NOTE: The ratio at 260/280 indicates protein or phenol contamination. A ratio close to 2 is acceptable. The ratio at 260/230 indicates EDTA, carbohydrates or phenol contaminants. Values between 2.0 - 2.2 are acceptable. Run 2 µg of total RNA and an RNA ladder on a 1.5% denaturing agarose gel; visualize on a gel documentation system (see Table of Materials). NOTE: A 2:1 ratio of clear and sharp 28S and 18S rRNA bands indicates an intact RNA. Partially degraded RNA resolves as a smeared appearance. Synthesize the complementary DNA (cDNA) from a single stranded RNA following the standard protocol (see Table of Materials)11. Prepare the reaction mixture for each sample: Mix 2 µL cDNA, 7 µL fluorescent compound, 300 nM forward primer, and 300 nM reverse primer (Table 1) in a final volume of 13 µL, and add to the 96-Well Reaction Plate (see Table of Materials). Seal the plate with an optical adhesive cover, centrifuge (300 x g, 1 min) and run the reaction on a Real-Time PCR System (hot start 95 °C for 20 s followed by 40 cycles: 95 °C for 3 s and 60 °C for 30 s) (see Table of Materials). Analyze the results by relative quantitation using the comparative method 2-ΔΔCt with the housekeeping genes glyceraldehyde-3-phosphate dehydrogenase (GAPDH) or acidic ribosomal phosphoprotein P0 (36B4)12. Treat the MLEC-04 cells following the conditions described in section 2 and evaluate the changes in the endothelial surface proteins by flow cytometry. Detach the cells after 6 h of LPS stimulation with the trypsin-EDTA method described in step 1.2.3, and wash with the incomplete media at 4 °C. Count the cells using the Neubauer chamber method and place 10 x 104 cells into u-bottom 96-well plates. Centrifuge (300 x g, 5 min) and discard supernatant by a 180° snap of the wrist from top to the bottom and quick recovery to the original position. Add 50 µL of the selected antibody diluted in the incomplete media (10 µg/mL, final concentration) to the cells and incubate (30 min, 4 °C). Wash the cells twice with the incomplete media following the procedure described in step 4.3, and incubate with 50 µL at 10 µg/mL of the corresponding secondary antibody coupled to FITC or a similar conjugate (30 min, 4 °C in a dark space). Wash the cells once with the incomplete media followed by a PBS wash. Recover the cells with 300 µL PBS using 1 mL pipette tips and place in cytometry tubes. Evaluate the samples in the flow cytometry system (see Table of Materials). Adjust the cell population by the forward and side scattering parameters. Gate the population of interest. Adjust gates based on the negative control from cells incubated with isotype control. Analyze the results as the percentage of positive cells or mean fluorescence intensity8. Seed the endothelium at sub-confluence in 6-well culture plates (7 x 105 cells/well) and treat with LPS as described in section 2. Analyze the inflammatory protein expression by the following western blot protocol. Ascertain the inflammatory proteins profile after 6 h of LPS stimulation. Determine the cell signaling every 15 min through a 60 min period. In both cases, stop the reaction by washing twice with cold PBS and store the samples at -80 °C until sample processing. Add 200 µL lysis buffer to each well (1% non-ionic surfactant, 10 mM Tris-HCl, 1mM EDTA, 150 mM sodium chloride, 30 mM sodium pyrophosphate, 50 mM sodium fluoride, 2.1 mM sodium orthovanadate at pH 7.6, supplemented with protease inhibitor cocktail) (see table of materials). Incubate for 15 min at 4 °C under agitation, scrape wells with a pipette tip and collect the homogenate in 1.5 mL tubes. Centrifuge the tubes at 11,600 x g at 4 °C. Store the supernatant in clean 1.5 mL tubes at -80 °C until processing. Measure the protein concentration by the bicinchoninic acid assay following the standard protocol (see table of materials)13. Resolve the 30 µg of total protein lysate for each sample by the standard technique of 0.1% sodium dodecyl sulfate, 10% polyacrylamide gel electrophoresis (SDS-PAGE)14. Run samples with 10 mM β-mercaptoethanol (reducing conditions) or without (non-reducing conditions) depending on the antibody used to detect the protein of interest. Transfer the separated proteins from the polyacrylamide gel to a polyvinylidene difluoride (PVDF) transfer membrane with 0.45 µm pore size using standard procedure. After transference, wash the membrane twice with PBS, 0.1% polysorbate-20 (PBS-T) and block unspecific binding sites by adding 20 mL 2% BSA diluted in PBS-T for detected phosphoproteins or 5% non-fat dry milk in PBS-T for total proteins, under agitation (90 min, RT). Dilute the selected antibody in 10 mL of the appropriate blocking buffer at the recommended concentration and incubate the membrane under agitation (ON, 4 °C). Alternatively, place the membrane in sealed plastic bags and used 5 mL of the diluted antibody. Next day, wash the membrane three times (excess PBS-T, 15 min, RT). Incubate the membrane under agitation (30 min, RT) with 10 mL of the correspondent secondary antibody bound to horseradish peroxidase (HRP) diluted at 1:10,000 in the appropriate blocking buffer. Wash the membrane three times under agitation (excess PBS-T, 15 min, RT). Incubate the membrane for 1 min with 0.1 mL/cm2 of the peroxidase substrate enhanced chemiluminescence (ECL). Place the drained membrane between two transparent plastic sheets, and insert it into the chemiluminescence detection system which includes a Charged-Coupled Device camera (CCD). Use the CCD camera to detect the signal and its software to record images with the accumulative program (images display accumulated signal at every 30 s exposure for a total 15 min period). Quantify the band intensity by densitometry using the ImageJ software following the protocol described in the user guide15. Open the sample in the ImageJ software and select the band of interest with rectangular selection tool. Select as the first lane and press plot lanes to obtain the profile plots. Delimit the area of the peaks with the straight-line selection. Measure the size of each band by clicking the inside of each peak. Represent the results with respect to loading protein control (β-actin, tubulin, etc.). Obtain the endothelial conditioned media. Treat the MLEC-04 cells as indicated in section 2 and collect the culture supernatant after 24 h stimulation with LPS (100 ng/mL). Collect the conditioned media from the treated MLEC-04 cells and centrifuge (600 x g). Keep the supernatant in 0.5 mL aliquots at -80 °C until use. Coat the 96-well plates with 50 µL/well of selected extracellular matrix proteins diluted in PBS (except for collagen, which is diluted in 0.1 M acetic acid): fibronectin (1 - 10 µg/mL), laminin (1 - 10 µg/mL) and collagen type I (10 - 40 µg/mL). Leave ON at 4 °C. Discard the coated media and block unspecific binding sites on wells with 150 µL PBS, 1 % BSA heat-inactivated (1 min, 100 °C) for 90 min at RT. Wash the wells twice with PBS and add 100 µL of previously collected endothelial conditioned media (section 6.1) to the wells. NOTE: Plates are ready for performing the adhesion assay. Culture the mouse monocyte-macrophage cell line J774 in a biological incubator (37 °C, 95% humidity, 5% CO2) with Roswell Park Memorial Institute Medium (RPMI), 10% FBS, 1% P/S. NOTE: The J774 cells grow in suspension. Collect the J774 cells into a 15 mL tube and centrifuge (300 x g, 5 min). Discard the supernatant and resuspend the cellular pellet with 10 mL serum-free media. Count the cells in a Neubauer chamber. Centrifuge the cells (300 x g, 5 min), discard the supernatant and resuspend the cells in serum-free media at 15 x 104 J774 cells per 50 µL media. Add 15 x 104 J774 cells to each well in 50 µL serum-free media and incubate for 15 min at 4 °C followed by 1 h at 37 °C in the CO2 cell incubator. Wash the wells twice, gently by adding warm PBS; centrifuge (300 x g, 5 min) and discard supernatant by a 180° snap of the wrist from top to the bottom and quick recovery to the original position. Fix the attached cells by adding 100 µL/well of 4% paraformaldehyde (PFA) in PBS and incubate (10 min, RT). Discard the media gently and permeabilize the cells with 2% methanol in PBS for 2 min at RT. Discard the media gently and stain the cells by adding 50 µL/well of 0.5% crystal violet in 20% methanol for 90 s at RT. Wash the plate with abundant running water, discard the excess liquid and leave it to air-dry. Report the attached cells by digital camera coupled to a light microscope. Treat the MLEC-04 cells on 96-well plates as described in section 2 and incubate with LPS (6 h, 37 °C). Fluorescently label J774 cells with Carboxyfluorescein Succinimidyl Ester (CSFE). Wash the J774 cells in PBS following the procedure in 6.2.5. Count the cells by the Neubauer chamber method and resuspend at 1 x 106 cells/mL in PBS, 0.1% BSA. Incubate the cells with CFSE (5 µM, final concentration) for 20 min at 37 °C. Add 5 mL incomplete media and incubate (5 min, 4 °C). Wash once with incomplete media as explained in 6.2.5., resuspend at 15 x 104 cells/100 µL and proceed to the co-adhesion assay. After the endothelium treatment, wash the wells three times with incomplete media. Add CFSE-J774 cells (15 x 104 cells/100 µL) to each endothelial-coated well. Incubate the plate for 10 min at 4 °C followed by 60 min at 37 °C. Lyse the cells in 0.1 M Tris-HCl pH 8.8, 1% SDS (100 µL/well) and measure the CFSE-J774 signal by fluorometry (excitation/emission = 492 nm/517 nm). Represent the results as arbitrary units of fluorescence intensity or percentage of adhesion with respect to positive control (signal from total cells added to each well). Fix the cells in 4% PFA and report the attachment of the CFSE-J774 cells to the endothelium by visualizing under a fluorescence microscope (excitation/emission = 492 nm/517 nm). The serum starved MLEC-04 cells were stimulated by 100 ng/mL of LPS for 6 h, and the endothelial gene expression was assessed using RT-qPCR by comparing the expression of activation markers to the resting condition. As shown in Figure 1A, the LPS-incubated MLEC-04 cells induced the mRNA expression of selected adhesion molecules involved in leukocyte recruitment during the inflammatory response (E-selectin, VCAM-1 and ICAM-1). PECAM-1 was used as an internal control because the expression is unmodified under this experimental treatment. Figure 1B represents the endothelial activation by LPS measured by the increased mRNA expression of the cytokines Ccl5, Cxcl10, and Cxcl1. These molecules are involved in the activation of circulating leukocytes, including their trafficking to the endothelial layer and later extravasation to the inflammation site. The cytokine, IL4, was used as an internal control under this experimental treatment. Figure 1: Evaluation of LPS-induced endothelial cells activation by RT-qPCR. The MLEC-04 cells were stimulated with 100 ng/mL of LPS for 6 h (red bars) compared to the control condition (blue bars), and the gene expression was analyzed by RT-qPCR. Graphs show fold induction of mRNA with respect to the control condition of selected endothelial adhesion molecules (A) and cytokines (B) involved in leukocyte activation and recruitment during the inflammatory response. PECAM-1 and IL4 were used as negative controls under this condition. Results are expressed as mean ± SEM from one experiment, out of three performed, carried out in triplicate. Please click here to view a larger version of this figure. Inflammatory stimulation was performed on the MLEC-04 cells as detailed in the previous section and the protein expression was investigated by western blot technique. 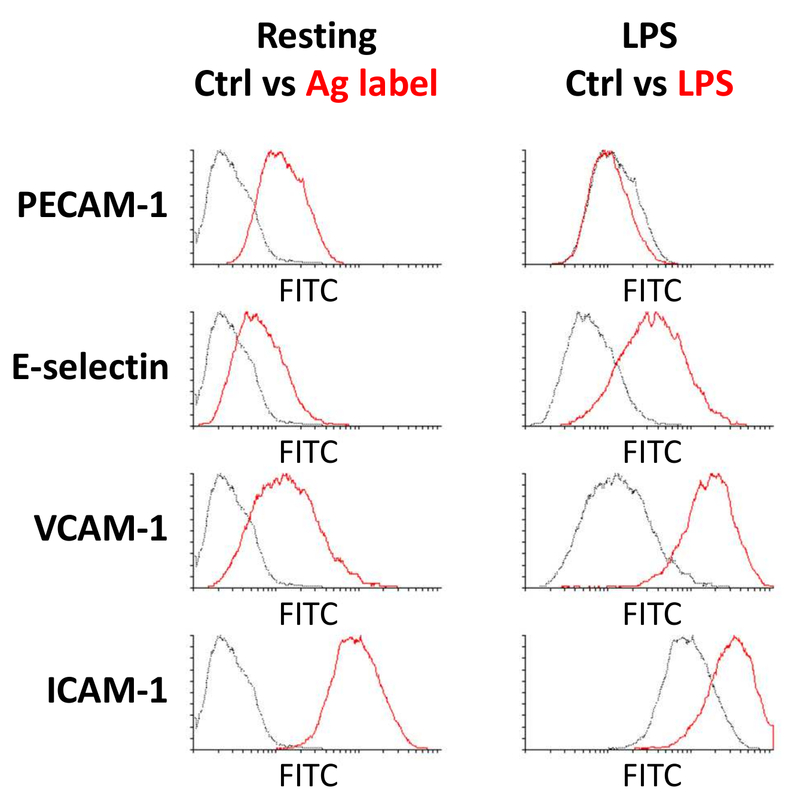 The resting endothelium presents almost undetectable levels of the adhesion molecules VCAM-1 and ICAM-1 (labeled as -). In the presence of LPS (+), the endothelial activated phenotype is evident by the upregulation of the expression of the described markers (Figure 2). The membranes were normalized by β-actin detection, which was used as the loading control to calculate the relative band densities after densitometry analysis. Figure 2: Protein expression of adhesion molecules on LPS-treated endothelial cells. 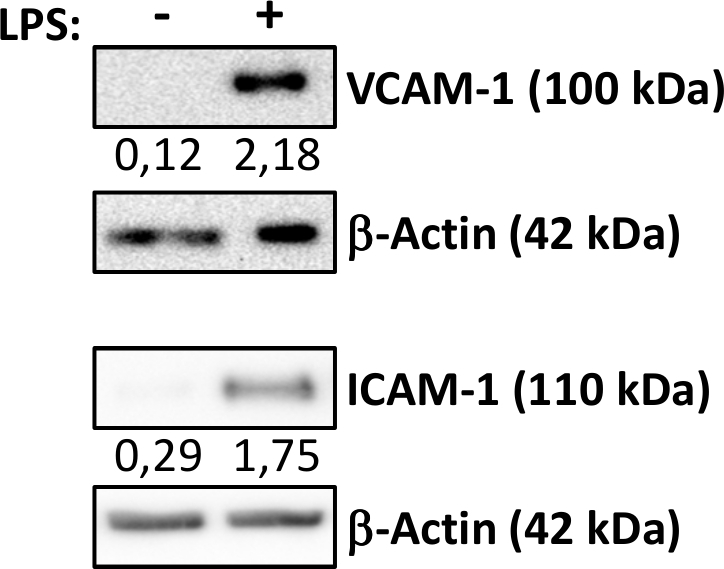 Representative western blot evaluating VCAM-1 and ICAM-1 protein expression in resting (-) compared to LPS-treated (+) MLEC-04 cells. The β-actin was used as a loading control. The molecular weight of each protein is in brackets. The values represent the semi-quantification of relative band densities. Please click here to view a larger version of this figure. The endothelial activation in the inflammatory context was evaluated by flow cytometry after 6 hour-stimulation by LPS (100 ng/mL). In this condition, the detection of adhesive-related molecules involved in leukocyte interaction was evaluated. The left panel of Figure 3A represents basal expression of the specified markers in the resting MLEC-04 cells (red-solid histogram) compared to the isotype negative control (black-dotted histogram). The right panel of Figure 3A shows the results derived from stimulated MLEC-04. The LPS treatment significantly upregulated the expression of the adhesion molecules E-selectin, VCAM-1 and ICAM-1 in the plasma membrane (red-solid histogram) when compared to the resting condition (black-dotted histogram). As shown in the cytometry profiles and cited before, the expression of PECAM-1 is unchanged in this experimental condition. Figure 3B shows the quantification values used as references to evaluate possible mediators of the endothelial inflammatory reaction. %: percentage of positive cells; MFI: mean fluorescence intensity. Figure 3: Endothelial surface markers in LPS-mediated inflammation. Flow cytometry profiles of the cell adhesion molecules on resting and LPS-stimulated MLEC-04 cells. The left panel shows protein expression on the resting cells (Antigen labeled-red histogram) with respect to the isotype matched control (Ctrl-black histogram). The right panel compares the control cell-surface protein expression (black histograms) to the LPS-treated endothelial cells (red histogram). Please click here to view a larger version of this figure. The mechanisms involved in the vascular compartment activation during inflammation are investigated by evaluating key signaling molecules. The MLEC-04 cells stimulated with LPS at different periods were processed for protein extraction, and the degree of activation was analyzed by western blot technique. Figure 4 shows that the IκB-α repressor of NF-κB signaling is phosphorylated after the 15 min LPS-incubation, and returns to basal levels after 1 hour. On the other hand, the LPS activates ERK 1/2 signaling after 15 min, which establishes an essential pathway involved in endothelial activation during the inflammatory response. The membranes were normalized by β-actin or ERK 1/2 detection, which were used as the loading controls to calculate the relative band densities after densitometry analysis. Figure 4: Signaling pathways triggered by LPS on endothelial cells. The MLEC-04 cells stimulated with 100 ng/mL of LPS for the times indicated in the figure and the signaling pathways ERK 1/2 (P-ERK 1/2) and NF-kB (through P-IκBα) were evaluated by western blot. The ERK 1/2 total and β-actin were used as loading controls in each condition. The molecular weight for each protein is in brackets. The values represent the semi-quantification of relative band densities. Please click here to view a larger version of this figure. The biological relevance of the regulation of endothelial activation on the progression of the inflammatory reaction is determined by functional assays of leukocyte performance. As described in the Protocol section, two different approaches are included for testing leukocyte function regulated by endothelial cells. Although the assays interrogate different aspects of the inflammatory response (RT-qPCR for endothelial cytokines released by the leukocyte activation, and western blot for endothelial adhesion molecules in the leukocyte interaction), the data obtained are both evaluate microscopic details of leukocyte attachment. The leukocyte activation by endothelial soluble factors is essential for developing an efficient inflammatory response, as it favors cell adhesion to several substrates. Figure 5A shows the J774 cell adhesion to 0.5 µg/mL fibronectin coated wells in response to previously collected conditioned media from the control or LPS treated endothelial cells. The bright field images and spectrophotometric measurements indicate that the factors released in the conditioned media from LPS-treated endothelium are sufficient to efficiently induce J774 activation, as shown by the induction of cell attachment to fibronectin. Figure 5B represents a co-adhesion assay to evaluate the ability of the vascular layer to support leukocyte firm adhesion by the novel expression of endothelial adhesion molecules. Briefly, the serum starved subconfluent cultures of the MLEC-04 cells stimulated with LPS for 6 h were washed several times and co-incubated with the leukocyte line J774 previously labeled with the fluorescent probe, CFSE. As shown in the micrographs and spectrofluorometric measurements, the LPS-vascular stimulation favors the interaction of CFSE-J774 cells to the endothelial monolayer. Figure 5: Leukocyte interaction to LPS-incubated endothelial monolayer by co-adhesion assay. (A) Light microscopy images showing crystal violet staining of the J774 cells attached to 0.5 µg/mL fibronectin coated wells in response to conditioned media from the control or LPS-treated endothelial cells. Scale bar, 50 µm. The spectrophotometric analysis shown below indicates the absorbance measurement expressed as arbitrary units (a.u.) ± SEM for a representative experiment run in triplicate. (B) Fluorescence micrographs show attached CFSE-J774 cells to the control or LPS-treated MLEC-04 cells evaluated by co-adhesion assay. Scale bar = 50 µm. The fluorometric analysis shown below indicates the fluorescence intensity expressed as arbitrary units (a.u.) ± SEM for a representative experiment run in triplicate. Please click here to view a larger version of this figure. Table 1: List of primers used in this study. Table 2: Endothelial surface markers in LPS-mediated inflammation. Quantification of cell adhesion molecules expression on the resting and LPS-stimulated MLEC-04 cells by flow cytometry analysis. The representative values for each marker corresponding to the percentage of positive cells (%) and mean fluorescence intensity (MFI) in the resting and LPS-stimulated endothelial cells. PECAM-1 was used as a negative control under these experimental conditions. This endothelial protocol describes a stepwise technology that establishes the groundwork for exploring novel mechanisms involved in the regulation of the inflammatory response. These approaches are based on the study of the endothelial activity stimulated by LPS and evaluate the critical steps involved in leukocyte recruitment during the inflammatory response, specifically: endothelial cytokines release, endothelial adhesion molecules expression and leukocyte adhesion to the vascular layer. Once the endothelial parameters are established, the system can search for novel compounds involved in the regulation of endothelial function and consequently, inflammatory progression. Those regulatory drugs can potentially be of interest to the pharmaceutical market. The major projection of this sequential protocol is to establish a foundation for extending these studies to different endothelial types and stimulatory conditions by adjusting to their relative vascular activity parameters. Drugs selected by this screening will constitute interesting candidates for designing novel therapeutic strategies against inflammatory disorders. On the one hand, the compounds that favor the endothelial response and contribute to leukocyte recruitment will be promising for immunodeficiency conditions16,17. On the other hand, the endothelial inhibitors would constitute excellent therapies for chronic inflammatory diseases10. Characterization of the cytokines expressed by stimulated endothelium predicts the evolution of the inflammation. Cytokines are small proteins released by the endothelial layer in the inflammatory context and strongly regulate leukocyte behavior. Pro-inflammatory members, such as Ccl5, Cxcl10 and Cxcl1, bind to their specific receptors on the leukocyte surface and signal to induce leukocyte interaction with the newly expressed adhesion molecules on the vascular layer (E-selectin, VCAM-1 and ICAM-1), and leukocyte migration to the pathological area (Figure 1, Figure 2, Figure 3)8,10,18. Other members of the same family of proteins are involved in the resolution of the inflammation and consequently tissue repair. The expression of these anti-inflammatory cytokines is relevant for chronic inflammatory diseases because they impede leukocyte recruitment and favor immunity clearance10,19,20. To select possible endothelial inflammatory regulators, it is recommended to perform this cytokine expression assay and evaluate the endothelial adhesion molecules expression in the presence of the compounds of interest. In fact, analyzing the levels between anti-inflammatory versus pro-inflammatory cytokines can be used as a predictive value for progression of the disease and reveals the drug of therapeutic interest21. The LPS binding to its cell surface receptor triggers complex intracellular signaling cascades led by MAP kinases ERK 1/2, JNK, and p38 and the NF-kB signalosome to induce the inflammatory transcriptional program. Many of these pathways are common to other inflammatory stimuli such as TNF-α or IL-110,22. 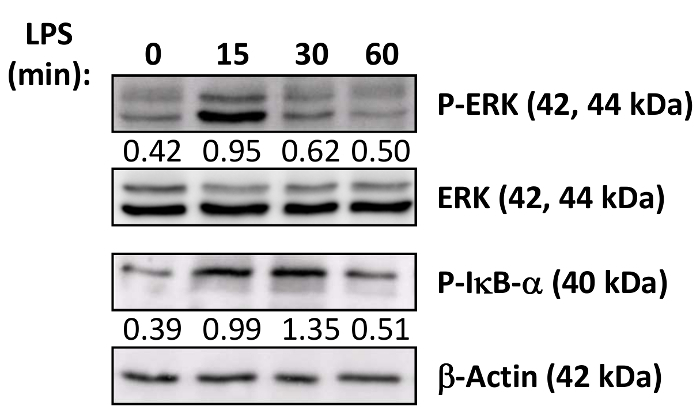 The endothelial activation is determined by detecting the phosphorylated form of the MAP kinase members as shown for ERK 1/2 in Figure 4. Moreover, the endothelial activation by LPS induces enzymatic activity of the IKKβ complex, which phosphorylates and degrades the NF-kB inhibitor complex IκB, thus allowing NF-kB effector members of nuclear translocation to perform the correspondent transcriptional activity (Figure 4). Characterizing the mechanisms by which the drug compound affects the endothelial inflammatory response is very useful, not only in describing the drug, but also in designing novel inflammatory treatments in combination with compatible conventional therapies23. The experimental proposal defined here is a versatile tool for future applications because of its ability to extrapolate to different cellular or stimulatory systems. The procedure can be modified to endothelium from different origins or species, and to test its functionality on several immune cells, as well as different inflammatory agents such as LPS, TNF-α, bacteria, virus, etc. As described in the text, researchers must first characterize the endothelial activation in their own system to later characterize the role of a selected compound on the inflammatory response. Limitations of the protocol are the selection of an appropriate negative control and defining precisely the endothelial activity parameters that discern the resting from the stimulated state. In the case that the conditions described in this paper do not work for a different system, researchers must troubleshoot the experimental parameters by performing additional time-dependent assays and using a concentration gradient of the inflammatory stimulus to define a stimulatory window that allows for testing new drugs for the regulation of the inflammatory response. To conclude, this endothelial inflammatory protocol is recommended for the search of new endothelial regulators targeting the inflammatory response. Performing this procedure will provide novel, interesting compounds that can be applied to studying its future applications and designing innovative vascular-specific therapies against inflammatory-related diseases, and which potentially could be of interest to the pharmaceutical market. This work was supported by the Ministerio de Economía y Competitividad (MINECO) and the Instituto de Salud Carlos III (ISCIII) (grant number IERPY 1149/16 to A.L. ; MPY 1410/09 to S. Hortelano); by the MINECO through the Fondo de Investigación en Salud (FIS) (grants numbers PI11.0036 and PI14.0055 to S. Hortelano). S. Herranz was supported by IERPY 1149/16 from ISCIII. Baumgart, D. C., Sandborn, W. J. Crohn's disease. Lancet. 380, (9853), 1590-1605 (2012). Skeoch, S., Bruce, I. N. Atherosclerosis in rheumatoid arthritis: is it all about inflammation? Nat Rev Rheumatol. 11, (7), 390-400 (2015). Gerhardt, T., Ley, K. Monocyte trafficking across the vessel wall. Cardiovasc Res. 107, (3), 321-330 (2015). Andonegui, G., et al. Mice that exclusively express TLR4 on endothelial cells can efficiently clear a lethal systemic Gram-negative bacterial infection. J Clin Invest. 119, (7), 1921-1930 (2009). McDonald, B., Jenne, C. N., Zhuo, L., Kimata, K., Kubes, P. Kupffer cells and activation of endothelial TLR4 coordinate neutrophil adhesion within liver sinusoids during endotoxemia. Am J Physiol Gastrointest Liver Physiol. 305, (11), G797-G806 (2013). Pober, J. S., Sessa, W. C. Evolving functions of endothelial cells in inflammation. Nat Rev Immunol. 7, (10), 803-815 (2007). Chamorro, Á, Dirnagl, U., Urra, X., Planas, A. M. Neuroprotection in acute stroke: targeting excitotoxicity, oxidative and nitrosative stress, and inflammation. Lancet Neurol. 15, (8), 869-881 (2016). Hortelano, S. ILK mediates LPS-induced vascular adhesion receptor expression and subsequent leucocyte trans-endothelial migration. Cardiovasc Res. 86, (2), 283-292 (2010). Palazón, A. Agonist anti-CD137 mAb act on tumor endothelial cells to enhance recruitment of activated T lymphocytes. Cancer Res. 71, (3), 801-811 (2011). Jiménez-García, L. 8,9-Dehydrohispanolone-15,16-lactol diterpene prevents LPS-triggered inflammatory responses by inhibiting endothelial activation. Biochem J. 473, (14), 2061-2071 (2016). SuperScript® III First-Strand Synthesis System for RT-PCR. Life Technologies. Available from: https://tools.thermofisher.com/content/sfs/manuals/superscriptIIIfirststrand_pps.pdf (2013). Livak, K. J., Schmittge, T. D. Analysis of relative gene expression data using real-time quantitative PCR and the 2(-Delta Delta C(T)) Method. Methods. 25, (4), 402-408 (2001). Pierce BCA Protein Assay Kit. Thermo Scientific. Available from: https://tools.thermofisher.com/content/sfs/manuals/MAN0011430_Pierce_BCA_Protein_Asy_UG.pdf (2017). He, F. Laemmli-SDS-PAGE. BIO-PROTOCOL. 1, (11), (2011). ImageJ User Guide. ImageJ. Available from: https://imagej.nih.gov/ij/docs/guide/user-guide-USbooklet.pdf (2017). Hohsfield, L. A., Humpel, C. Intravenous infusion of monocytes isolated from 2-week-old mice enhances clearance of Beta-amyloid plaques in an Alzheimer mouse model. PloS One. 10, (4), e0121930 (2015). Hofland, R. W., Thijsen, S. F. T., Verhagen, M. A. M. T., Schenk, Y., Bossink, A. W. J. Tuberculosis during TNF-α inhibitor therapy, despite screening. Thorax. 68, (11), 1079-1080 (2013). Tedgui, A., Mallat, Z. Anti-inflammatory mechanisms in the vascular wall. Circ Res. 88, (9), 877-887 (2001). Zheng, Y., Humphry, M., Maguire, J. J., Bennett, M. R., Clarke, M. C. H. Intracellular interleukin-1 receptor 2 binding prevents cleavage and activity of interleukin-1α, controlling necrosis-induced sterile inflammation. Immunity. 38, (2), 285-295 (2013). Pripp, A. H., Stanišić, M. The correlation between pro- and anti-inflammatory cytokines in chronic subdural hematoma patients assessed with factor analysis. PloS One. 9, (2), e90149 (2014). Guha, M., Mackman, N. LPS induction of gene expression in human monocytes. Cell Signal. 13, (2), 85-94 (2001). Tabas, I., Glass, C. K. Anti-inflammatory therapy in chronic disease: challenges and opportunities. Science. 339, (6116), 166-172 (2013).